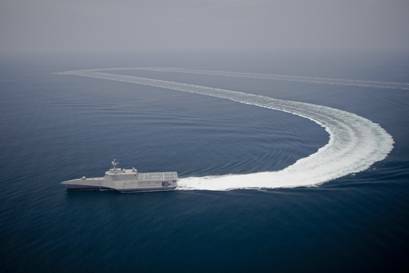 Austal announce new strategic partnerships in the Asia-Pacific region to enhance its support to the US Navy & others in the region. Following on from the strategic partnership with Singapore’s Sembawang Shipyard Pte Ltd announced in January 2013, Austal has now secured similar agreements with Unithai Shipyard and Engineering located within Thailand's main international deep-sea port of Laem Chabang, and with the Cam Ranh Shipyard in Vietnam. Based on the MOU, Unithai Shipyard in Thailand will be Austal’s preferred repair shipyard for US-owned commercial and defence vessels, such as the LCSs and JHSVs, that require repairs when operating near Thailand. The yard occupies 688,000 square metres of prime water frontage adjacent to the main port area. Core activities are a complete range of ship repair, modification, conversion, shipbuilding and offshore oil and gas fabrication work. In Vietnam, Austal has signed an MOU with Cam Ranh Shipyard . The modern shipyard is strategically located in one of the best deep water harbours in the world, approximately equal distances from Hong Kong, Manila and Singapore, and is one of 26 shipyards within the Vietnam Shipbuilding Industry Group (Vinashin), which is majority-owned by the Vietnamese Government.